The 700-24 MagnaValve® is a normally closed valve that regulates the flow of non-ferrous media in either direct pressure- or suction-type air blast machines. 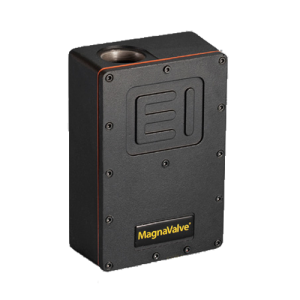 The MagnaValve’s built-in sensor measures flow rate and, together with the FC-24 Controller (sold separately), provides accurate and repeatable flow rates. The valve meets the accuracy requirements of SAE AMS 2430, AMS 2432 and other aerospace and commercial specifications required for shot peening applications. Ceramic Bead and Glass Bead can be used in this valve. Other non-ferrous materials, such as Aluminum Oxide (AlOx), may also be used by special arrangement. Contact the factory for more information. Each valve will be pre-calibrated with customer-specified media. The MagnaValve’s construction incorporates an electromagnetically controlled plunger for media flow control. The plunger rests in an orifice. With power applied, an electromagnet raises the plunger to allow media to flow through the valve. The media falls past the plunger and drops onto a paddle, bending it according to the media’s flow rate and thereby producing an accurate flow rate signal. When no power is applied to the MagnaValve, the plunger returns to its rest position and stops all media flow. If the power is interrupted for any reason, the plunger returns to the rest position and securely holds the media, thereby virtually eliminating media leakage. 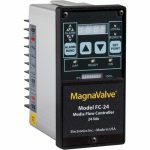 The FC-24 Controller provides a closed-loop system for the MagnaValve. 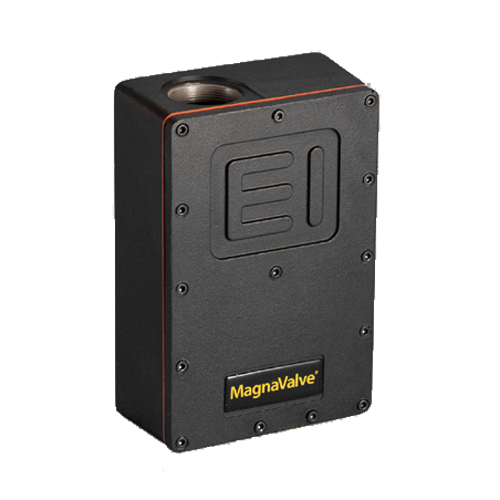 The MagnaValve and controller provide accurate regulation of non-ferrous media in shot peening and blast cleaning applications where accurate and repeatable flow rates are desired. The controller may operate as a stand-alone control or work with a customer’s programmable controller via standard analog 0-10 Vdc interface. 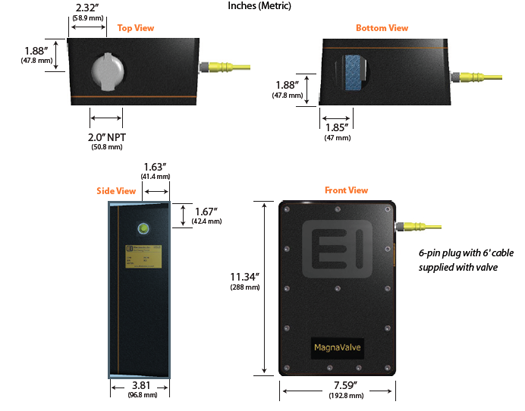 The flow rate signal from the MagnaValve is used as the flow rate feedback signal to the FC-24 Controller.